IFR: You Had Better Know What the Hell to Do...Now! Of course, this is not news to anyone. I like to think of earning an IFR training to sort of like earning a Master's Degree, it is a distant relative to primary training, but it adds a great deal of required elements to the stick and rudder skills you learned to earn your PPL. On Saturday, a nice happy mound of high pressure sat comfortably over Western Oregon, with "clear and a million" forecast from the coast to the dry side over in Bend/Redmond. So we launched to Cape Blanco State Airport (5S6), which has trails leading from the end of the runway to gorgeous Blacklock Point, overlooking a dramatic view of the Pacific and Cape Blanco itself. The forecast WX was to be VFR all day, with "light rain" predicted in North Bend, the nearest real weather to 5S6 later in the evening. As we plodded on towards our destination, my first hint that the WX guessers might have gotten this all wrong was that we were only making 75 knots of ground speed, in a plane that sees 120-125 in a no-wind situation. Cape Blanco State Airport sits about 3/4 of a mile inland from a large cliff overlooking the stunning scenery of Oregon's Pacific Coast. The hike from the approach end of runway 14 takes a meandering route through groves of firs and ceders that at times blocks out the sun entirely. It was the kind of hike that makes me fall in love with my state...peaceful, at one with nature, and with only one other human on the trail. We launched into that same gusty wind, and it had picked up to an estimated 14G35. I aimed Katy north towards KOTH and as we climbed out over a small ridge east of the airport, it was easy to see that visibility was going down fast. How the WX instruments at KOTH could say this was 7,500 overcast is a mystery, it was clearly more like 2,000 overcast. With a known MEA to Eugene of 5,000, I realized this was quickly going to become an IFR flight. I also did not want to attempt a gut-wrench of an approach back to 5S6. After slowing Katy to "thinking speed", I called Seattle Center to file en route. This was one tip Jim gave me that was golden...always know the frequency of the "Center" who owns your airspace. I had put the ILS plate into KOTH on the yoke, and right there was 121.4 for ZSE. ATC took the request, and soon I was climbing through the soup towards the North Bend VOR. What saved this flight was my CFI-Is insistence that I be prepared, and then to just think things through in their logical order. I handled the radios well because I had the right plates and charts already pulled. 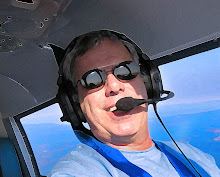 I flew level and on course with the help of my S-Tec 50 autopilot, which kept us on airway perfectly. We leveled at 5,000 and were in and out of the clouds until maybe 10NM SW of KEUG, where the arrival back at home was a non-event. This was another of those "lessons learned" flights that seem to happen quite frequently to this relatively new IFR stick. On three different occasions since earning my ticket, the WX guessers were off and I had to use everything in my IFR toolkit to cause a safe outcome to the flight. But what is the major takeaway here is that I HAD this IFR skill set in the first place. When flights into IMC can go so terribly wrong in an instant, you had better know what to do...NOW. That, my flying friends, is why IFR training is hard. Because if were easy, pilots would not be prepared for these kinds of flights, and souls would perish. 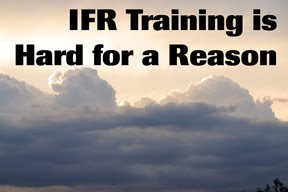 So, if you are now – or may be in the future – hiring a CFI-I to earn your IFR ticket, find one that will wring you out, beat you up, and slap you around until you learn this stuff instinctively. I am sure as hell glad I did.